After a long tiring day at work, I come home and find this awesomely rad gift from Johnsonville in the mail. I don't cook, but I might start just so I can wear this sweet apron! Check out the Johnsonville site...if their sausages are as good as their promotion team, then they must be a winner! Last night we went to Crispo, an Italian restaurant near Union Square. The first thing that struck my attention was how wholly un-Italian the atmosphere was. While I wasn’t expecting red checkered table cloths or a mustached mandolin player, the abstract art that adorned the walls and moody lounge lighting definitely told me that I was in for something different tonight. The first pleasure of the night came at the bar. From blood orange martinis to whiskey lemonade, the creative assortment of cocktails showed great originality and were an excellent way to open the evening. I highly recommend the white pear sangria, light and refreshing, and served with clear enthusiasm from the man tending bar. 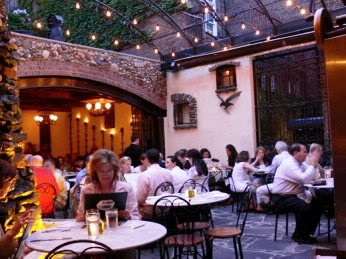 There are few things life greater than an open air restaurant in the summertime and it’s here that Crispo’s architecture really stands out. The rear garden area is ingeniously designed so that the lights and crossbeams spanning the open space above you creates a faux ceiling that almost makes the sky and stars beyond it feel like an illusion, like eating at Hogwarts. The atmosphere is genuinely unique as the classy warmth of eating inside blends quietly with the charm of dining under the stars. Make sure to specifically request this if you’re making a reservation. A rush of ladies entered the room at the Sheraton on May 13th for the 25th anniversary Amelia Earhart Award Luncheon honoring Barbara Lynch. Boston-based Barbara Lynch is one of the country's leading chefs and restaurateurs who first gained fame with her highly acclaimed restaurant No. 9 Park. Over the last ten years, she has expanded her Boston-based Barbara Lynch Gruppo to include B&G Oysters, The Butcher Shop, Stir, Drink, and Sportello. “Welcome! Hi,” the voice of Elisabeth Babcock, president and CEO of the Crittenton Women’s Union (CWU) floated throughout the room, announcing the commencement of the ceremony. She thanked the crowd for the endless support and spoke a few words about CWU and their goals to help low-income women overcome barriers and succeed in today’s world. Next on the microphone was Helene Gaudette. Ms. Gaudette amazed the crowd with her empowering story of how CWU changed her life. By now, I had already devoured my simple piece of salmon that sat atop a bed of leafy greens, potatoes, and crisp green beans and began to get a little overwhelmed by all the questions from all the sociable ladies that surrounded me at my table. I had been asked about three times if I knew a Betsy. This past Tuesday night took me back again to the jail-turned-posh-it-spot The Liberty Hotel for the Taste of Beacon Hill. My purpose for this visit was not to scope out the fashion like last week, but to sample the variety of foods in the Beacon Hill area - I'm getting back to the Finance Foodie roots! Armed with an empty stomach and decked out in my strechy (food consumption) pants, I set out to see what Beacon Hill had to offer. 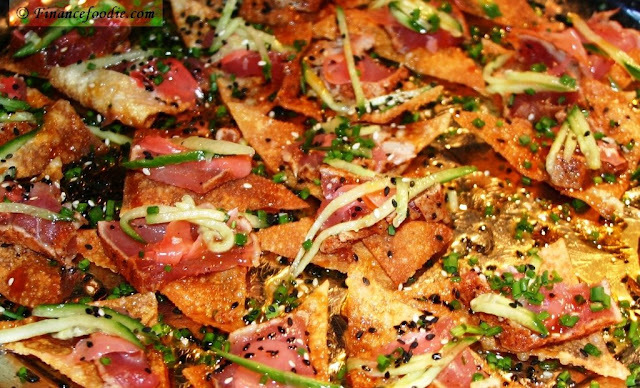 I really liked this offering of seared ahi tuna on fried wonton crisps, drizzled with sweet soy sauce from Scollay Square. As I watch old episodes of “America’s Next Top Model” (Tyra B.=fierce! ), I am reminded about the Carmen Marc Valvo fashion show I attended last Saturday afternoon at the Liberty Hotel. Held to benefit Ovations for the Cure, a non profit organization dedicated to the research, patient outreach, and awareness of ovarian cancer, this event combined high fashion with a great cause in a beautiful setting. I was pumped to cover this event – and even more thrilled that my new events correspondent Jessica “Fast Foodie” was able to join me – go Team Finance Foodie! Remembering the near starvation experience from the last fashion show I attended, I made a mental note to pack a few snacks for the day. Unfortunately, my mental notes are usually forgotten faster than those one hit wonders from VH1’s "Where areThey Now." 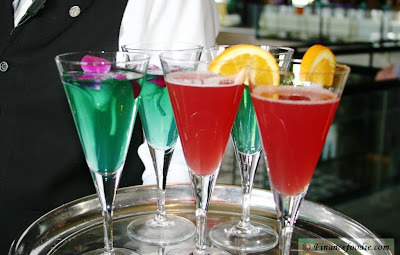 Thankfully, I lucked out because I arrived to a beautiful raw bar, desserts, and of course, the fashion show standard, cocktails! 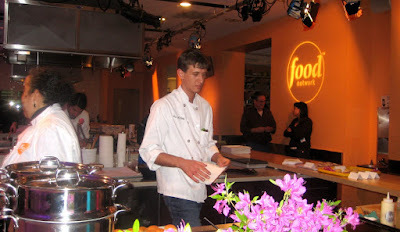 So last night was the Food2.com Launch Party at the Food Network Test Kitchen in NYC. Food2 is a rad new site from the Food Network that aimed at the twenty-something foodie who is hip, trendy, and down with pop culture.